#tbt The Best Gift Ever! I have really been enjoying the concept of Throwback Thursday lately. So much so that this year, your Brown Gothamite is going to have some fun with #tbt. Starting here in fact. I have been lucky to work as an educator for two decades. Due to this, I have had some truly wonderful memories. Easily one of the most memorable was the presentation of an end of the year gift in June 2006. I was ending my time as a homeroom teacher due to my becoming a full time time administrator. This was bittersweet, because there is a special bond that a homeroom teacher often develop with his or her students. I had certainly developed such a bond with my 6th grade homeroom that year. This class and their parents decided to give me an end of the year thank you gift. At my previous two schools, I had received gifts with a significant dollar amount, anything from tickets to a Knicks game to a Gucci tie to $100 worth of American Express gift cards. Listen, I enjoyed the heck out of those gifts. However, I was fine to move to a school that did not have the same type of gift policy. It certainly evens the playing field and emphasizes creativity. During my previous two years as a homeroom teacher at this school, I received a cool tee shirt designed by my students and a butterfly chair with art work painted on the canvas. Truly thoughtful and wonderful gifts that I have treasured. I still own the shirt, and my wife and I have used the chair in my daughter's room. But, the gift I received from the 2006 group left me speechless and crying. This group wrote and produced a song in my honor. The song is all about the subjects we learned, goofy things we discussed, and our group's eccentricities. 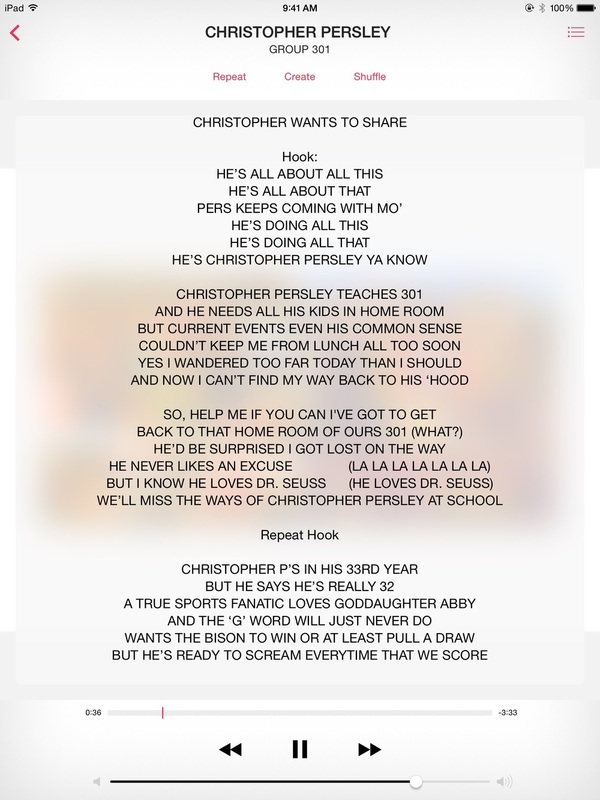 It's entitled, "Christopher Persley", so I actually have a song about me. It's still difficult to wrap my brain around this concept. You know what, it's a damn good song. My daughter loves it, too. See for yourself below! Thanks, again to that group for such an amazingly creative gift, one I will also love. Posted on January 8, 2015 by Christopher Persley and tagged #tbt #browngothamite.